We understand endurance sports and we understand how to make sure you reach your goals, as well as staying healthy before, during and after the event. We know marathons so well because we run them too (John Nugus’ last time was 2 hrs 46 mins, Ian Wilkinson came in at 3 hrs 26 mins), so we really understand the field. 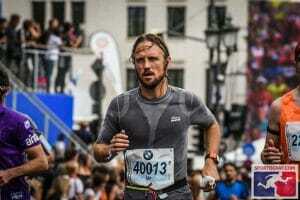 Ian Wilkinson, Senior MSK Physiotherapist, on his way to towards 3 hrs 26 mins in the Berlin marathon this year. If you need rapid access to expert care, right on your doorstep, then we’re able to help. Every London City Physiotherapist has at least 7 years’ post-graduate experience, or an MSc in a related discipline. Just as in business, experience really counts in sports health. With a fully equipped gym to aid injury prevention or rehabilitation, as well as that expertise in marathons, our elite team are able to provide the highest standards of clinical care. We provide bio-mechanical assessments, personal training, massage services and Pilates support for your core health, so we’re able to deliver a suite of individual elements to help you achieve, perform and recover well. Although all our services are available as individual items, we’re also using our experience of what really works to craft some structured marathon packages, which can include everything you’ll need to attain and then stay on top form. You can contact our team at any time for more information about any of our services. Our specialist marathon packages, as well as our sports massage services, are available to book online.